Dreams do come true. Ask Premiere, south San Jose's reigning R&B songbirds in waiting. In the past two years, Leslye Maninang, Alisha and Gigi Floresca worked with En Vogue producers Thomas McElroy and Denzil Foster, put out an album (Premiere), a hit single and video ("Something About You"). And they did all this while still pursuing their educations: Alisha, 17, is at Evergreen Valley College. Leslye, 20, is at San Jose State. Gigi, 14, is a sophomore at Santa Teresa High School. Premiere's best ofs? Valley Fair, Oakridge, Eastridge, Capitol 16, Great America, Raging Waters, Pastimes bowling alley. After bowling wrecks their nails, they get some new sets done at Nail Art, near Blossom Hill and Snell. 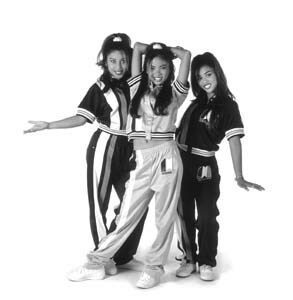 As for Premiere, they're tired of being called "the next En Vogue." We'll just call them the Best R&B Vocal Group. Maybe next year, someone at the Grammy podium will follow our lead. Project Writers: Cecily Barnes (Willow Glen), Trystan L. Bass (Downtown San Jose, Burbank area), Clarence Cromwell (east San Jose), Anne Gelhaus (west San Jose), Todd S. Inoue (Campbell, Japantown, south San Jose), Michele Jenkins (South County), Shari Kaplan (Los Gatos), Michelle Ku (Santa Clara), Sue Fagalde Lick (Saratoga), Andrew X. Pham (Cupertino), Sarah Stanek (Sunnyvale), John Waters (Los Altos, Mountain View), Bernice Yeung (Milpitas, north San Jose) and Heather Zimmerman (Rose Garden area, Palo Alto). Writers at Large: Eric Johnson, Michael Learmonth and Richard von Busack. Editors and Proofreaders: Corinne Asturias, Carol Bee, Broos Campbell, Michael S. Gant, Dan Pulcrano, Sharan Street. Research Assistance: Paul Durias, Ian Johnson, Cassandra Nash, Jacob Pickering, Karen Reardanz. From the Sept. 18-24, 1997 issue of Metro.